A GALLUP POLL last month found that 50 percent of Americans identified themselves as "pro-choice" on abortion, surpassing the 44% who called themselves "pro-life." It was the first time in seven years that the pro-choice label was more popular — as recently as 2012, Gallup was reporting that the share of self-described "pro-choice" Americans had dipped to an all-time low of 41 percent. Whatever Americans may call themselves, however, fewer and fewer are getting abortions. From the Associated Press this week came word that abortion rates are plunging in almost every state, in many cases by more than a fifth since 2010. 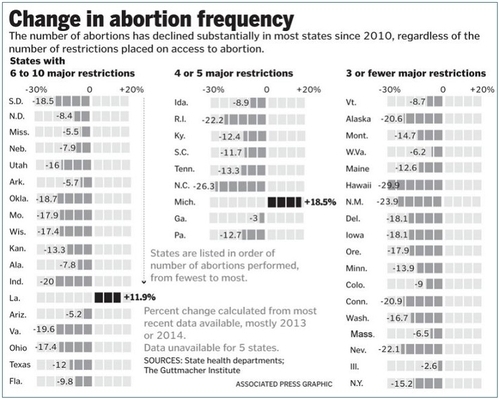 "Abortions have declined in states where new laws make it harder to have them," the AP's David Crary wrote, "but they've also waned in states where abortion rights are protected." Indeed, some of the steepest drops occurred in five states that have imposed no restrictions on abortion clinics in recent years — Hawaii (where abortions have shrunk by 30 percent), New Mexico (24 percent), Nevada and Rhode Island (22 percent), and Connecticut (21 percent). Health departments in 45 states supplied the AP with abortion data. In only two of those states, Michigan and Louisiana, were abortions up over the past five years. This is only the latest report to confirm a marked decline in US abortion rates. The Guttmacher Institute, a pro-abortion-rights research group, published a study last year showing that both the number and frequency of abortions have been decreasing, gradually but steadily, for nearly 25 years. The Centers for Disease Control, using a different methodology, came to a similar conclusion: "Legal induced abortions ... reached historic lows." Pro-choice activists claim that abortions are down because contraceptive use is up. In an interview with the Associated Press, Judy Tabar, the CEO of Planned Parenthood of Southern New England, attributed the lower abortion rates to the "free" birth control provided under Obamacare. But that's implausible. Abortion rates have been retreating for decades, while the rate of unplanned pregnancies in the United States, a little less than 50 percent, has barely budged since the 1980s. The drop in the teen abortion rate has been especially dramatic; it fell by more than 66 percent from its peak in 1988. In part, that is a function of fewer teenagers getting pregnant: the teen pregnancy rate plummeted by a stunning 51 percent between 1990 and 2010. But there has also been an empathy-driven reaction against abortion among the generation of Americans that grew up in a world of vivid ultrasound images, and among the miracles of neonatal medicine that now make it possible even for babies born extremely prematurely to survive and flourish. Millennials have grown up amid the grim images of abortion and its aftermath. For many, the willful destruction of life in the womb seems less an act of "reproductive freedom" than an act of violence against an innocent victim. All of them know someone who has had a legal abortion; they need only look in a mirror to see someone else who could have been lawfully aborted. It has been a long time since Roe v. Wade legalized abortion in every state, and, in the companion case of Doe v. Bolton , effectively proclaimed a right to destroy an unborn baby at any stage of pregnancy. But making abortion lawful didn't make it right. Even after all these years, Americans tend to regard most abortions as ignoble. According to Gallup, only 38 percent of US adults generally see abortion as morally acceptable. Other surveys concur. The Pew Research Center found in 2013 that 49 percent of Americans believe that having an abortion is morally wrong, far outnumbering those who regard abortion as morally acceptable (15 percent) or not a moral issue (23 percent). Young Americans — voters under 30 — were once the most gung-ho in support of unfettered legal abortion. In 1991, fully 36 percent believed abortion should be legal under any circumstances. But by 2010, 18-to-29-year-olds had become more pro-life than their parents — only 24 percent still wanted to keep abortion legal in all cases. More than any other age cohort, in fact, young adults are now the most likely to think abortion should be illegal in all circumstances. In a sense, every American born since 1973 is a survivor of Roe . Perhaps that explains why, however young people might label themselves, abortion is a choice so few of them are prepared to take.